News: Before we get started, a quick announcement. I've recently become a contributing blogger at www.midwestwargaming.com, a group based in Iowa City. For an international community, that's pretty local for me, being in Omaha, and I'm happy to join these guys. Almost all of my articles will be featured there, and in all honesty, it's quite possible that the redundancy will mean that this particular site no longer gets maintained. I don't know, haven't decided yet. My personal hobby stuff won't go to MWWG, but idk that my personal hobby stuff will warrant a blog of their own. So we'll see. For you MWWG followers that are seeing me here for the first time, a little bit about me. I've been wargaming for nine years, and my articles focus on hobby and painting. Batreps are a possibility, but since I'm no longer playing Warmachine, and Guildball doesn't batrep very well, I doubt I'll do many of them. My local Horus Heresy Meta is spinning out of control though, with a well planned Isstvan event in our future, so that will probably be an article of it's own. We'll see. As I said before, I'm currently living near Omaha. I've been married to my lovely wife for almost four years, and we introduced our first child, a son, into our home last September. I play Guildball for my competitive game, and 30k Horus Heresy for fun. You may see me at a couple of cons in the area (Tricon in Sioux City or Musecon in Des Moines, or the Bugeater in Omaha), but that's about it. So, on to the article. Eventually, someone will tell you that you need one, or they have one, or whatever. Eventually, it will come up, and it's going to click that those models you've seen painted with these beautiful smooth blends aren't done by hand. Usually. They're done with an airbrush. Jolly Roger Studios is a great example of what can be done with an airbrush. Then you look at getting one. Just a quick Amazon search, maybe a google article like this one and the guy lists an easy 300$ worth of supplies. Minimum. That's before you buy any air paints, or cleaner, or brush holders or anything. That's a brush, an air supply, maybe a hose and a regulator. At this point, you shelve this idea until either A) You rob a bank successfully or B) You start a new army/game and your wrist literally cramps at the thought of hand painting them all. The Carpal Tunnel seeps into your forearms and begs you to consider an airbrush. So we're googling articles again. Let's cover the basics. I. Why do I need an airbrush? What can I do with it? This is important because despite seeing what your favorite Golden Demon winner can do with an airbrush, you can't. Not for a long time. So realistically, what is it going to accomplish? II. What do I need to start? Basics. The stuff I can convince my wife on. III. What do I want after that? The stuff that I can pick up for 5-15$ at a time over the course of when that situation arises. IV. Basic troubleshooting because heck yes, we bought an airbrush and I can't believe I wasted my money on this heap of trash. Day 1-4 was really bad for me. I. Why do I need an Airbrush? We can presume that because you're here, you've already largely decided what good it would do you, but lets set forth some realistic expectations. The Airbrush is not the end all, be all of painting. In fact, some armies aren't going to hardly let you break it out at all. Airbrushing does a few things extremely well. At this stage, primarily, it's going to basecoat and shade large portions very quickly. On a good day, where the temperature is right and my paints are in good shape, I can knock out 30+ models basecoated in under an hour. Easy. Infantry. Tanks, you're still looking at 5-6 minutes apiece to basecoat and shade.. It also does Object Source Lighting very well since it simulates the light with the spray of the brush. It does OSL extremely naturally. All those sweet searchlights on those space marine tanks? Probably an air brush. Where you're going to have problems are armies/models with lots of different colors. For example, I airbrushed my Fennblades from the Trollblood faction in Warmachine. They're shirtless, so the torso, arms and some of the legs are all the same color. That's 60, 70% of the model. Airbrush the skin tones. Do an overspray and it's shaded. Done. On the same token, the Highwaymen from the same faction, I did not airbrush. I did multiple colors, nobody had the same clothes pattern or anything. Was completely pointless to airbrush it IMO because there was no color that was greater than 10% of the range. Warhammer Space Marine armies love airbrushes. I wouldn't do another space marine army without one. They're 90% the same color with few exceptions. Airbrush a space marine and all you've got are some metals, eyes, some edging and the gun. A few minor details and the dude is done. In comparison, a Cryx army from Warmachine has blacks, greens and metals. A lot. Pretty evenly distributed. You might pick one and airbrush it but it's not going to be worth the time savings like a Space Marine army would be, or Khador where literally everything is red. This all varies obviously with your color scheme, but if you're looking at doing some fancy schemes that are going to have three and four main colors, the Airbrush isn't going to save you a lot of time. It's also not going to do much more than the basecoating. It's good for the OSL later, but that's one of the few details you can do with a brush. After the basecoat, your airbrush probably won't be out much longer. And if you're not going to shade your army, you might as well use the GW rattlecans. So, don't expect to never pick up a brush again. You'll do a lot of traditional brush work yet. The Airbrush just sets the base layer and does most of the blending work for you. Large, single/dual color armies are where it wants to be. II. What do I need to start? There's some varied responses on this one. Even after you've come to terms with the up front cost of the brush itself, the real pill to get down is the compressor, which is almost always more than the brush. Let's break this up. We'll talk brush first, then the equipment to run it. A. The Brush Your first brush is a tough one. You get what you pay for, but I also feel like you're only saving maybe 30$ if you skimp out on a solid mid-high range brush. My first one was a Neo Iwata. My wife bought it for me on a 40% off coupon and it worked ok for awhile. It was really bad about clogging though, and did not clean well, whatsoever. I got to where I didn't want to pull it out except for the largest jobs that pretty much required it. The jobs like Warmachine Colossals that even if the brush causes problems, the time saved is still a large amount. 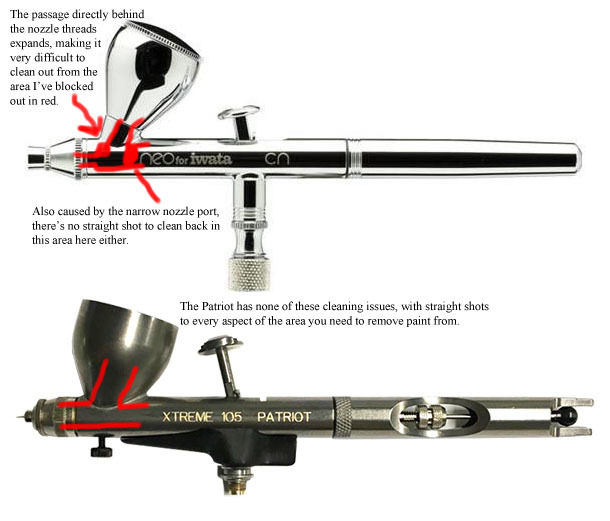 Since the two brushes I've owned and used extensively cover both ends of the spectrum pretty well (without getting into the obvious failures like non-dual action, or some of the aerosol wannabes from companies like Testors that should know better), I'm going to talk about them. My wife bought me a Neo for my birthday, first year of marriage. We'd looked around a little bit and we bought the Iwata because it was cheap. That's basically it. Dual action, gravity fed, airbrush. Hobby Lobby had a 40% off daily coupon that knocked it down to extremely affordable so she got me one and it almost ruined airbrushing for me. At first, I was pretty sure it was just me, but as time went on it became clearer that a lot of it was the brush too. On sunny, perfect days with perfect airbrush paint, it would work for awhile. But eventually, the nozzle would clog. The passage behind the threads would build up. Paint would work back up through the brush. Etc. On it's best day, I still disassembled it to clean it, front to back, every ten minutes. At some point, since I live in Nebraska, it was clear I needed something a little less finicky. So I got the Badger Xtreme off of Amazon for like 80$ or 90$ bucks, only 20-30$ more than the Iwata is retail, before the 40% coupon. The Badger not only does all the basic things the Iwata did, but better. Like someone actually put thought into it. The cap on the end doesn't need to come off to remove the brush, the nut is visible to remove the also visible brush. There is no nosecone to collect paint and build up. There's a nice little last-minute air regulator on the chin of the brush. The trigger sits up higher for more control. And someone actually cleaned a brush and built this brush to be cleaned as well. In the image below, I try to explain more. Do you have to buy the Xtreme? Or the newest Paasche? Not at all, but if you're able to look at a brush before you buy it, or a similar model, do so. Find some online reviews where they take it apart. As a new airbrusher, you're going to have to clean your brush often, no matter what. The Iwata cannot be cleaned effectively and every three or four sessions, the brush needs a come-to-jesus conversation where you're bending wire and breaking qtips trying to clean out the brush. The badger A) doesn't need cleaned that often and B) skips the first 3 or 4 steps with a much simpler, easier access design. B. The Other Stuff. Bare basics of running the brush is a hose, regulator, tank. You should also consider a cartridge mask, and an airbrush booth because acrylic is toxic for you, the family and the dog. Don't do this in the living room on commercials. The hose is 10$. Done. Make sure it's the right brand, but my badger came with an adapter for the Neo hose, so that's cool. A regulator can be a normal air regulator from your hardware store. 15$ probably. Get one with a gauge. You should be able to lay eyes on the pressure going through your brush. Depending on where you live (high moisture), you'll want a moisture trap too. I really do recommend the cartridge mask and use mine every time. They're about 30$ by the time you buy filters. A dust mask is not the same. An airbrush booth is also nice. They can be anywhere from 40-100$. I built mine for like, 12$. I took a 2x3 box, cut out the bottom and set it on edge. I put a furnace filter in the back and a 10$ walmart boxfan behind it. Boom. Works great, but I still use my mask. This just keeps the acrylic localized. Now the hard part. The tank. Or compressor. Or both. 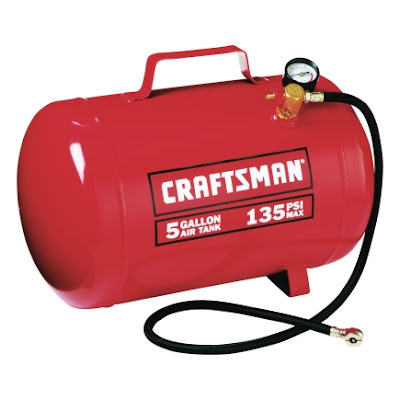 Right off the bat, do you already have a compressor that you would use for pneumatic guns or anything, or ready access to one? Get 30-40$ air tank from Harbor freight and call it good. If you don't already have a compressor, but you can think of many situations that it would be nice to have one, then don't budget for the airbrush compressor, get the real deal. A portable compressor is anywhere from 140-200$. It'll run air tools (ratchets, drills, nail guns), fill tires, just be an all around useful thing to have. Even if it's not something you would have thought of getting seriously before, by the time you look at the price of an airbrush compressor that's made specifically for little brushes, you might as well consider the real deal. Mine's a pancake compressor we bought to run a roofing gun back when Dad was a rental property owner. So let me just plant that bug in your ear. Consider the real deal. The cheap way to all of this though is with an airtank. Get that 30-40$ one from Harbor Freight or whatever cheap hardware store you have locally. They're rated for about 110psi. I airbrushed 3 tanks, two walkers and four units, all with about 4 colors each, and it dropped to around half. That's more than enough for most airbrush sessions. Easily. The nice thing about most air tanks is that they have a fill port that's just like your tire's fill port, allowing you to fill the thing at a gas station. For free, in most cases. Before I bought my air compressor, I filled my tank at work or at the gas station. It was the cost of the tank, a regulator and a hose. And on mine, I installed quick-disconnect air fittings at the tank so I could disconnect it from the airbrush assembly and connect it to any air hose if I wanted to fill it that way. My regulator and the airbrush hose are all one piece and can be removed from the air tank at any point, plugged directly onto a compressor, whatever. Even with my own compressor, I still have this air tank because the compressor is loud, and I actually don't want it run whenever it wants. So for around 65$ (regulator, hose, tank), you can be good to go. Spend an extra buck on teflon tape to seal the threads and you're golden. This one here is a perfect example. Unscrew the regular airhose with a crimped tire fitting from the valve and replace with a regulator. If you've never hooked anything up like this before, carry the whole assembly into your hardware store and they'll tell you connections you need to hook up your regulator. In most cases, it's 1/4 connections. I really, and honestly, dislike airbrush specific compressors. They only benefit is that they're tiny. But they still make noise, still need regulated, and by the time you've spent money on them, you should have just spent the extra money on something you can use on so many other things. Seriously, when your buddy roofs a house, and you go rent a belt-fed nail gun and show up with your compressor, he'll love you. III. What do I want after that? If you haven't already gotten the mask/airbooth, that should be the first thing. Next is one of those nice airbrush buckets for cleaning. It's less about having a "cleaner" and more about having someplace that you can set an airbrush for a second without spilling your paint because it turns out, those kinds of places don't exist naturally. Airbrush cleaner is also nice but I tend to use water more often than not because if all I'm doing is a color change, I don't want to mix Airbrush cleaner into my paint and then spray it on a model. Airbrush cleaner is good for the last clean at the end of the day. Qtips, wire cleaners. Etc. Depends on the brush you need. I have a bunch of cleaning supplies I'll never use because my Badger isn't a poorly designed piece of bantha fodder. If you haven't invested in Airbrush Paints yet (The Vallejo line is really good), you should try it. I tried to just water down my paints for a long time and that was one reason I didn't know that a lot of it was my brush and not me, because I really couldn't get the consistency right. Now that I've had some experience, I'd probably be ok, but buying airbrush paint is so much easier. The brush is going to hurt your feelings at some point. The Xtreme has only bugged me once, but it wasn't a problem with the brush, but rather the paint. The simple operating procedure is to pour your paint in the pot, then pull the trigger back to control your air and push it down to control how much paint you feed. The air passing siphons the paint through the tip and into the airstream (you're not actually blowing the paint, but sucking it). Should be pretty simple. Spend some time playing with the brush, closer and farther to figure out your ideal working distance, and controlling the trigger to manipulate it to what you need. Eventually though, it'll hurt your feelings and you have to fix it. Lots of spatter. Small spatter. Your airbrush pressure is too high and is feeling dragging the paint out with it. Take it down a notch. Lower pressure is generally better. 23-26 psi. Lots of spatter. Large spatter. Larger drops than you would think possible. Somewhere, paint is collecting on the outside of your brush. If you scroll back up to that picture, you can see on the left side that the Badger does not have a nose cone while the Iwata does. My Badger doesn't really do this, but the Iwata will build up paint on the inside of that cone and then start blowing the drops off, creating a large spatter. This buildup is caused by your paint being too wet. Also, that nose cone is pretty useless. It's not there to direct your paint, so take it off. The paint being too wet is a problem, so fix that, but that nose cone has zero forgiveness whatsoever. Brush is spitting. Or doing nothing. Ram the trigger all the way to the back repeatedly. See if you can get any sudden bursts. Sometimes, you can force through whatever the problem is and continue airbrushing (definitely worth trying if your pot is loaded, otherwise you're wasting that paint to clean the brush). If you can get sudden spurts, keep trying. Look at the end of the chassis, and pull the trigger back to pull the brush out. Clean off that exit where the brush and paint come out. Sometimes paint dries on that exit port, but make sure your brush is pulled back or you'll bend the tip. The Iwata was really bad about this too. If you can't get the brush to work it through, dump your paint, clean it out and try again. If you get into the nozzle and find a lot of dried paint up in there, either you let it sit and dry, or it's probably too cold for the brush. Trying to run an airbrush in an area that's less than 50-55F is pretty hopeless. Not only is the metal brush cold to the touch, but that much air flowing past it turns it into a heatsink that cools and dries paint extremely quick. There's a margin of error that can be accounted for if you can keep your paints warm. I surrounded a coffee mug (with coffee in it, obviously) with paints, nestled up against the exterior and that worked ok. You can also thin them above normal and that will help, but usually, you'll still dump pots and clean several times and it's just not worth doing. If you're going to try it, pour small amounts so the loss is minimal when you clean, thin your paints, and keep them warm. If it's just spitting and the temperature is fine, then your paint is probably at fault. Either it's too thick (even the airbrush paints need help sometimes), or it's actually got stuff in it. One of my greys got a bunch of dried pigment in it so it had these chunks of paint that constantly got wedged in the brush. It was fine for brush painting with, but for airbrushing, it was really ruining the process. If your paint is good to go, then really look at how clean that brush actually is. Try and see every surface. This is where the Iwata really frustrated me because that area I marked in red would build up, and at this point, it would start clogging my brush. I spent an hour picking at that chunk, trying to get it out. Literally no angle for it. That was my last day using that brush. The nozzle/tip, the threaded or pressed piece that is the final stage for the brush, it likes to get dried paint and sometimes it sneaks past you. I have found the the brush itself is the best at cleaning this thing. Circular and stabbing motions, pushing dried paint out the exit. Last but not least, check your tank. You might be empty. Airbrushing is a massive timesaver, most of the time. The upfront cost is the biggest downside, and if your army can't make the most of it, then don't worry about it. But those armies that occupy one or two large colors, the airbrush really makes it work. I wouldn't do another 40k, 30k or Warmachine army without one. Hopefully this helps with some initial ideas airbrushing and the cost involved. Any questions or comments are appreciated and I'm more than happy to help with advising setups and parts. 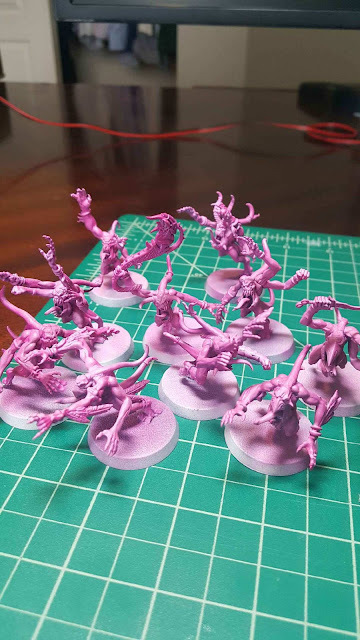 I just recently helped a good friend of mine build his, and he churned out some pink horrors on his first solo run. Took him just a few minutes. The airbrush is awesome for this kind of thing. Again, hope this article helps somewhat, and feel free to throw things in my general direction.